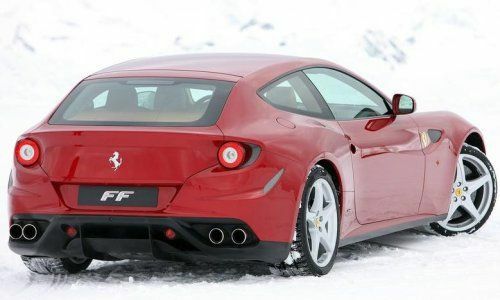 The Ferrari FF is a truly revolutionary vehicle from the Italian supercar maker with this four seat supercar packing four wheel drive so it can take more power, more places than any Ferrari ever before. However, in the world of high end sports cars, you can never have too much to offer the buyer so Ferrari is teaming up with Apple to combine two of the most widely recognized brands in the world together in a remarkable high performance, high tech supercar for four. Unfortunately, the details are limited at this point but what we know is that Apple will integrate the Siri voice command system to the Ferrari FF. It seems like every car on the market offers an infotainment system with voice recognition but as we know all too well – not all of those systems work as well as the consumer would like. However, Apple’s Siri voice command system that is a part of the popularity behind the iPhone is regarded as one of the best systems of its kind on the market today. This means that once Siri has been added to the Ferrari FF, the Italian all wheel drive shooting brake will offer drivers what could be the best voice command system on the market today. In addition to the new Siri voice command integration in the Ferrari FF, the optional rear seat entertainment package will also come with a pair of iPad Mini units that attach to the back of the front headrests. This means that rear riders in the Ferrari FF will not only be able to watch movies and listen to music but they will also be able to access the internet and enjoy all of the other features of the iPad Mini. Compare that to a standard rear seat monitor system that cannot do anything without an input device and you have an entertainment system that is better than the competition in much the same way that the FF itself is better than other four seat supercars on the market today. No further information is known about the budding partnership between Ferrari and Apple including any price increase coming with these new high tech features but when you consider the fact that the Ferrari FF starts around $300,000 – a grand or two more will be but a drop in the bucket for the average Ferrari buyer. Supercars have historically set the pace for the non-supercar segment so once the Ferrari lineup has Siri integration and iPads serving as part of the rear seat entertainment package, it is now only a matter of time before we see something similar from other automakers. Ferrari is owned by Fiat, who also owns the Chrysler Group brand. Apple’s senior vice president of internet software and services Eddie Cue joined the Ferrari board of directors last year so you would think that those companies in cahoots with Ferrari (like Chrysler, through Fiat) could be the first affordable models in the US to feature similar integration. Ferrari will most likely cling to this advantage in technology until the competition comes up with something flashier and at that point – we would expect to see Siri and the addition of iPads to more vehicles under the Fiat umbrella.